This book has been written and reviewed over many years, starting during my years in business as an Osteopath and Chiropractor. During the 48 years I spent with patients, I learned to counsel these people as well, as I spent one full hour with them each visit. The diseases I am talking about in the book, were not only physical. Healing comes in many forms and over the years I found that for every physical ailment, there was usually an emotional reason as well. All my treatments were of the natural kind and never did I use artificial methods to approach a problem. Sometimes one finds it difficult to find natural healing methods, but they are there and have been there for centuries. Going back through history, natural remedies and methods have been used by native indians, The Chinese and Japanese healers, aboriginals in Australia and so on. The western societies were also deeply involved in natural healing, such as with herbs, flowers and more. I often mention the fact that we as practitioners are not really the healers. The healing comes from within the patient, so he/she is the healer. We as practitioners are really the directors, pointing the patients into the right direction, sometimes using herbs, vitamins and minerals and/or manipulations, to re-set the body, so it can function properly again. It is so important, that the body is in it’s original design state all the time, as circulation, nerve actions, organ functions and alike, depend on a free flow of energy for efficiency. Only a correctly adjusted body will do this. The treatments we receive should be holistic in their nature. It is never good enough to only treat a small part of the body and hope the treatments we receive are going to heal the rest. It also takes a good deal of thought. Every patient is different and the practitioner should be aware of the subtle differences between all people, even if they all presented the same problem. Nobody is the same as the next person. Each treatment should be designed for a particular patient, otherwise it will not work. I am proud of the fact, to have achieved this knowledge during my working years. I had a great success rate and had patients come to my clinic from far and wide, I mean thousands of kilometres away at times. things down for you to ponder over and maybe to find a practitioner who will treat and help you equally or even better. believe in, to help you. Do this in good, deep faith and it will happen. You WILL get help I promise. I recently have been travelling as a gypsy in a caravan and people find me, wherever I am, to talk and to solve some of their problems. This is so amazing. I may be in a National Park or at a rest stop and somehow they find me amongst all the people. I believe in synchronicity and that is why this happens. The Universal power, sends them to meet me, as they are calling out for help, sometimes without realizing they are calling for help. The reports I get back are so amazing and it makes me very happy. I will give you some testimonials from people, whom I have treated in the past. 1) A lady, who came to my clinic with such bad arthritis in her fingers and hands, she could not lift her teapot and therefore she could not have her daily cups of tea. She came to me when she was well into her sixties; there would very likely be no cure, as things were so bad. Her fingers were gnarled and very lumpy with arthritic bumps. When I first saw her, I was a bit concerned, but I believe that we can always improve, even if there is not a complete cure. Anyway, I gave her instructions on alkalizing her system, some silica 6x and gave her massage on her hands with deep heating herbs. She was to continue these instructions for six weeks and return to me for a check-up. When she returned, she was so pleased, as she was able to make herself a cup of tea again and the pain had stopped. She was so thrilled and gave me a big hug. She thanked me for giving her some more quality of life. animals and they would not let him go. He was still living at home and this created the problem. When he told me this I was a little perplexed, because of his age, but I suggested he go to the travel office and get all the information he needed to go to Africa. I also told him to sit down with his parents that night and explain to them that he was of age and asked them for their blessing on his intended trip. They realised the facts and let him go. Two years later he returned to me to report on his trip and experiences and at the same time he thanked me for giving him such positive advice. That was pleasing for me to hear, that all was well with him and his parents as well. 3) A man at the age of 28 came to me as he had problems playing squash. He was a B- grade player and could not win the competition at the end of the season each year. He asked me for advice and when I saw his posture, I realised what was going on. He needed his spine corrected badly. I asked him what his profession was. He was a grader driver on the local council, making new roads etc. I worked on him 3 times and sent him home to live with a new and corrected spine. The year after I treated him, he won the B-grade competition and challenged the A-grade champion, whom he beat as well. He was so thrilled. He came back especially to tell me the good news. So you see what can be done in many different ways. We can help people with physical problems as well as mental and emotional upsets. I have always had the love in my heart for you, my brothers and sisters out there and it was always easy for me to help. It was a natural thing for me to do, as I believe in the Master, who gave me the knowledge and persistence, to keep trying, even at times the case before me seemed impossible to treat or cure. Healing this way has always been my passion from as early as my childhood and therefore I chose Physiotherapy first and graduated to Osteopathy later. By the time you have read my book, you will be very much wiser on all aspects of natural living and management of your circumstances, for yourself as well as all the members of your family. Buy the book and I know you will not be disappointed. It will not necessarily be an easy journey, but the results will be very pleasing and satisfactory. May I wish you the best of good health and a long and beautiful life. I have written many more articles on various subjects since this book was published and I hope you can read them as well. The greater part of my book and following editions and extensions, which are now being written and produced shortly, are based on Prevention of diseases. We should not have to be treated, because if we live a healthy, fulfilled and happy life, we will not get sick. Sickness is a sign of neglect. That is what I and my writings are all about and I would like you to follow these trends. Make the decision to be well, especially your children and buy the book, something you will never regret. People who have bought the book are extremely happy and are telling others. Some people say that they have read all the books on diets and slimming and vitamins etc, but that is NOT what I write about. It is not that simple and most books concentrate on one part of life only instead of the WHOLE BEING, including our emotional, mental, spiritual, sexual and psychological being, which play a vital part of living. 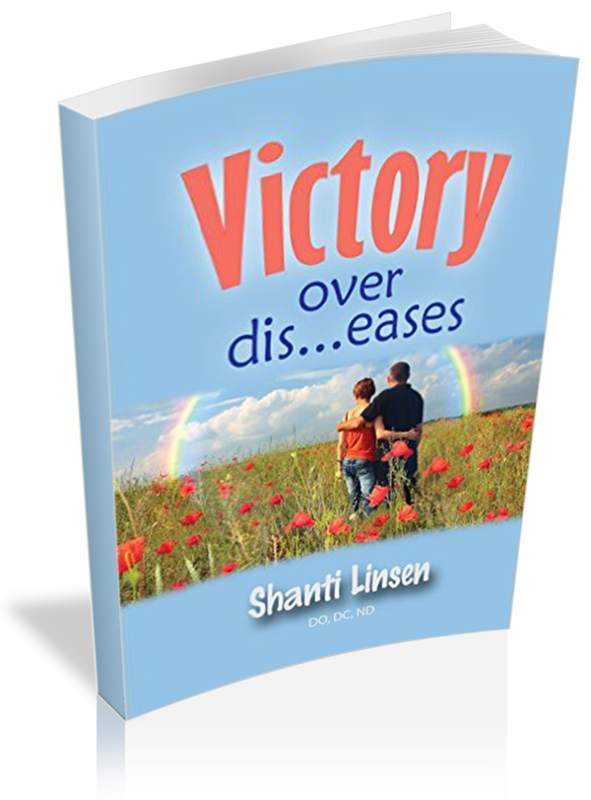 The book is also available on “Amazon.com Shanti Linsen“. Buy my book, I hope you will enjoy a healthier life.